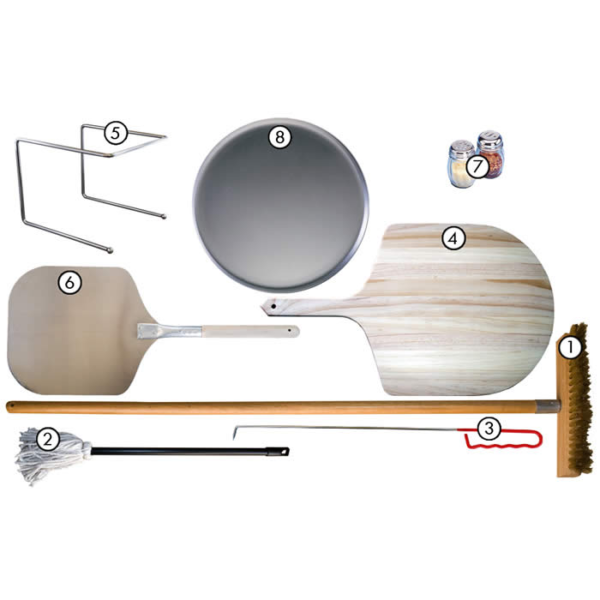 Basic Pizza Accessories Kit Pizza Oven Tools And More! Cook Like a Pro! Wildwood makes it easy to accessorize with out convenient wood fired pizza oven accessory kits. If you're just getting started with wood oven cooking, this a great kit for you! Every item in the kit has been selected by our culinary department as the “essential tools to have”. Pizza Oven Tools are a great way to get maximum enjoyment form your wood fired pizza oven. Having the right pizza oven tools make all the difference. Our Basic kit is a good place to start when choosing oven tools. We combined all the basic essential tools for you. All the items in our kits are the same products used by our test kitchen staff daily. The items are high quality and will serve you well. A necessity for fine ash removal left by the oven brush. Use prior to launching pizzas and bread. Also good for general hearth clean-up (use slightly damp. Attend a cooking class today!